Zen Studios has confirmed to Joystiq that the developer’s 2D RTS game CastleStorm will be released on Xbox Live Arcade and Windows 8 sometime this April. For those who may have missed CastleStorm‘s original announcement at E3 last year, the game is a 2D real-time-strategy title that also contains several gameplay elements from the tower defense genre. Players first choose to play as either the Knights or Vikings, then take the fight to the opposing team over the course of twelve campaign levels. During the battles players will need to split their time between; managing resources, selecting different types of troops to send marching towards the opposing fortress, using their own castle’s ranged weapons for both defense and offense, and occasionally putting themselves on the front lines of the raging conflict. Additionally, the game features a robust castle editor that allows players to customize their own castle’s appearance and weapons, and then test out those defenses before taking the fighting structure into battle. 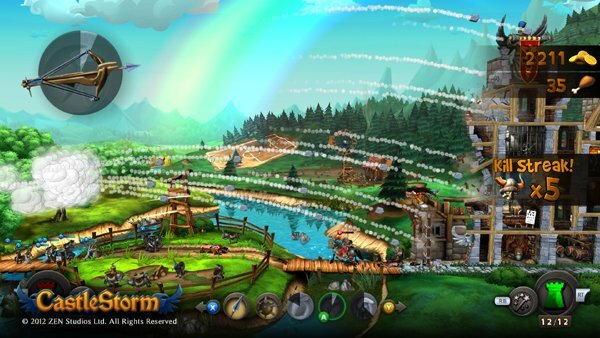 Basically, CastleStorm‘s gameplay is a bit like Zen Studios took Swords and Soldiers and mixed it together with some tower defense building elements and then tossed in a hint of Angry Birds‘ projectile destruction. In no way is that a bad combination. Aside from the twelve main campaign levels, CastleStorm also includes online multiplayer and co-op modes, so there should be plenty there to keep players busy. Zen Studios has not yet revealed a price point for the game, but once they do we will be sure to let you know. In the meantime, make sure to check out the CastleStorm‘s original E3 2012 announcement trailer embedded below, which will give you a decent idea as to what to expect from the game’s battle system. Also, feel free to click over the the title’s Karaoke trailer that was released last year for some additional gameplay footage and sing-along fun!